QUITE early in January the opening ball of the St. Petersburg season was given at the Winter Palace. Over five thousand people were present, and it was indeed a gay scene. The Empress wore white chiffon embroidered with chenille and sparkling sequins, and many diamonds. The Grand Duchess Serge wore mauve. She is sister to the Empress, and the Grand Duke was the Emperor's uncle; they have no children. The Grand Duchess Serge is a very beautiful woman; some people, indeed, even consider her handsomer than the Empress. The Imperial family was still in mourning for the Grand Duke George, so all wore either white or mauve. The ball was opened by a polonaise. The master of the ceremonies went before the Emperor and Empress, walking backwards, and cleared a way for them through the crowd. After him came Princess Galitzin, the senior lady of the Court, then came the Emperor and Empress, grand dukes and duchesses, Royal princes and princesses, the ambassadors and their wives, all moving slowly, in pairs. At the conclusion of the polonaise general dancing began. The Emperor and Empress went amongst their guests and spoke a few words to most of them. The Japanese Ambassador and his wife were there; he wore European uniform, and she was clad in a pink satin dress, made high and with long sleeves. The supper-rooms were beautifully arranged like gardens. There were groups of palms, flowering lilacs, and laburnums, etc., appearing out of grassy beds in which grew crocuses, daffodils, and other flowering bulbs. Walks covered with carpets to imitate sand ran through the rooms in various directions; electric lamps hung in the trees and tables were set out under their shade. For the supper were provided three hundred and fifty dishes of chicken, each dish containing three chickens with salad and jelly; three hundred and fifty large lobsters, with mayonnaise sauce, and three hundred and fifty tongues and the same number of dishes of cold assorted meats, also of ices, creams, jellies, etc., besides cakes, biscuits, etc. Also several hundred gallons of soup of various kinds. Two thousand bundles of asparagus were boiled for the salads; there were also quantities of fruit and wine. A ball at the palace is good for trade in St. Petersburg. I was invited to the kitchens to see the preparations, and was greatly amused and interested to see the people. Counts, barons, hotel proprietors, etc., all came in to see the chef and bargain with him for the remains of these delicacies. The chef is paid so much a head for the supper; he buys things in large quantities, and sends abroad for some. He orders what he likes, provides the supper, receives the money from the Emperor, and pockets what he can make out of the transaction. Every season five or six balls are given, beside many great dinners, and twice a week there is a representation in the palace theatre, either an opera or a play, followed by a supper. It may not be generally known that the Emperor has an opera company and an acting company, which includes a ballet. On the 6th of January the ceremony of blessing the waters is performed. A mass at which all appear in full court costume is celebrated in the Winter Palace Cathedral. That finished, the priests, in their most gorgeous vestments, followed by the Emperor and grand dukes and the gentlemen of the various courts, go to a pavilion erected over the river, and there the priests solemnly bless the waters, a hole being cut in the ice for the purpose into which a cross is lowered. They then go through the crowd which always assembles and sprinkle them from a brush dipped into the holy water. Some of the water is then brought into the palace and put into glasses reserved specially for it, and it is then drunk after many prayers and much blessing of themselves by the Russians. Formerly, when the hole was cut in the ice, numbers of people plunged into the water, and afterwards went from door to door showing their frozen garments as a proof of their holiness, and asking alms from the charitably disposed. But from time to time one of those self-made martyrs was drowned and there were many abuses, so the authorities put an end to the plunging. The ladies of the Court used formerly to go in the procession, but bare shoulders were not exactly conducive to health with the thermometer standing often at twenty degrees below freezing point, and therefore the practice was discontinued. We stayed at St. Petersburg until towards the end of Lent. On one occasion the Prince of Siam came to visit the Empress, and the children were in the room. Now I was interested to see his dusky highness as I had met him before at a little seaside resort in the west of Ireland. He had been invited to spend the summer holidays with a school-fellow, and Kilkee was chosen by his family for their holiday-resort. Some of the visitors there got up a little entertainment for the benefit of the poor, and he and his friends were invited to help. The entertainment took the form of tableaux, with a little music. The young prince was deeply interested in all, and finally begged for a part for himself. One excuse after another was offered to him, but at last to our consternation he ex claimed, ÒI know why you will not have me. It is because I am an Eastern. Well, I'll make a tableau all for myself." He went home and presently re-appeared with an armful of curtains, table-cloths, etc. Throwing these down in a corner of the hall, he went out again, and presently returned with all the false jewellery the village shops could supply, and announced that he intended to personate the Queen of Sheba when she had seen Solomon's magnificence. He quickly dressed the platform to represent an Eastern interior, and, draping himself in a shawl, squatted, native fashion, in the middle of the stage. It was wonderfully effective. On the evening of the exhibition the tableau was by far the finest, being so much out of the common. The boy was delighted with himself and his audience. When I saw him in the Winter Palace he was dressed in Russian uniform, and looked about him with the same bright, interested expression he had worn in Ireland. Naturally he did not recognise me. My little charges ran forward and examined him with deep interest, walking slowly round him, and regarding him with beaming smiles of amusement. The Empress said to the Grand Duchess Tatiana, "Come, shake hands with this gentleman, Tatiana." She laughed, and said, "That is not a gentleman, mama; that's only a monkey." The Empress, covered with confusion, said, "You are a monkey yourself, Tatiana," but the prince laughed heartily. They and the prince afterwards became quite good friends. We went that year to Moscow for Easter, and stayed in the historic Kremlin. Moscow is the most characteristic city I have seen; for the most part it is distinctly modern, but conveys the impression of antiquity even more successfully than St. Petersburg does. The Kremlin and all that part are very old; there is a great room having a throne draped with ermine. All round the walls are painted frescoes. One set represents the history of Joseph and his brethren. They are dressed as Russian peasants in shirts and top-boots; Potiphar's wife is attired in a bright blue dress, showing a white petticoat. She evidently wore a crinoline, also a pair of boots with high heels and white stockings. Another set represents the wandering of the children of Israel in the wilderness; Russian costume again prevails amongst them. Another wall is taken up with the judgment of Vladimir. 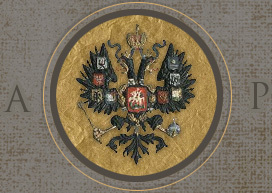 He was the first Christian Emperor of Russia. Tradition says that a Jew had oppressed a Christian woman, who called to Vladimir for help. The verdict went against the Jew, who straightway gave all his property to wife and children, and then said he had nothing to pay with. Vladimir ordered his head to be shaved, and that he should be mounted on a donkey and led through the town with his hands tied. He was accordingly brought out, but had not proceeded very far when he offered to refund all that he had unjustly extorted, and even more. The flies and stinging insects which abound in Russia had punished him by alighting on his shaven head. On the floor of this room is a carpet made in a convent. It represents years of work, and it is made of pieces of cloth stitched together and bordered with fancy stitching in gold-coloured thread. On each piece is worked a regimental badge in the national colours. I thought it ugly and confusing to the eyes, but I have heard it very much admired. At the top of this room, right up under the ceiling and artfully arranged so as to be invisible from below, is a window from which the secluded women could look down upon the festivities below. Here the poor young grand duchesses used to get a peep at their future husbands. The rooms where they lived are still shown; they were bare and miserable, with the windows very high up. Poor things! their lives must have been lamentable; they occupied themselves with needlework and much of their tapestry and cross-stitch work still exists. In a church in the Kremlin there is a carpet worked by the ladies of one of the courts. In the palace at Gatchina are tapestries representing the history of the world, beginning with the Garden of Eden and ending with Solomon's Court, also the work of the ladies of the Court. Queen Elizabeth gave Ivan the Terrible some magnificent silver tankards and cups of beautiful workmanship, far more beautiful than any modern work, I think. This silver is all displayed in the great room I have described. The museum is well worth a visit. Here are hung up in a circle all the crowns belonging to the various Emperors and Empresses now dead. Catherine the Great had all the jewels of her crown picked out and made into an ornament for her personal adornment, and there hangs her crown with its jewelless holes, a lasting monument to her character. Catherine I., who was a slave girl unable to read, was far more noble in character. There are numbers of thrones, from a little ivory chair which formerly belonged to some of the Georgian kings, to the silver one which was brought from Kieff. I sat in most of them to the great horror of some of the Russians. Some of the thrones have cords stretched across the corners to prevent such sacrilege. Here are hung up in a glass case the robes worn by the Emperor, Empress and Dowager Empress on the occasion of their coronations. All, even to the gloves and shoes, are displayed. I should like to have retained something, if only a glove, in memory of such a momentous ceremony. In presses round the walls of another room are kept the coronation robes of former sovereigns. Li Hung Chang brought a carved eagle to the Emperor and a screen to the Empress. The eagle is about five feet high, and stands on the carved trunk of a tree. Each feather is carved separately and can be withdrawn from the body of the bird, and the whole thing packed in a small space. It is of ivory and ebony, a most wonderful piece of work. I thought at first that the screen was painted, but it is not. It is executed with the needle, is in four panels, each representing the sea under a different aspect, while on the reverse side gulls are embroidered flying, feeding, and swimming -- a truly marvellous piece of work, every part of the canvas being covered with stitches. It took eight of the most expert needlewomen in China three years to execute. There is a collection in the museum of old state carriages -- wonderful erections, all gilding and velvet, with delicately painted panels. Catherine's travelling carriage is there. There is a long table down the middle of it, and how it could be turned I know not; it is rather larger than an ordinary tramcar or 'bus. Indeed, I do not believe that there is a street in Moscow in which one of those carriages could be turned. The little Grand Duchess Olga sat in each carriage in turn; finally she selected the largest and handsomest, and said, "I'll have this one." She then gave orders quite seriously that the carriage should be sent to Tsarskoe Selo for her. She was told that could not be, so she ordered that it should be prepared for her daily drive. I was very pleased that her ideas on the subject of the carriage were not carried out. Moscow has many picture galleries and places of interest, and the town itself is so interesting that it is well worth a visit. Moscow is particularly nice at Easter. Something in the atmosphere of the place makes it seem suitable for that festival. They say that Holy Moscow contains seventy times seven churches; as a matter of fact, there are many more, one out of every five buildings being a church. What supports them, and how the priests live, I have never been able to find out. Many of these churches are very beautiful and interesting. As in St. Petersburg, there is a large English colony and an English church. The streets are for the most part paved with cobble stones, so they are very noisy to drive over. Some of the churches are very old, as they escaped the fire. Many of the holy icons have had almost miraculous escapes from being destroyed. One of the churches in the Kremlin contains a picture with the mark of a sword-cut like a great scar across it, but the canvas was not cut. I t has also the marks of something on the back, and it is said that it was thrown out of church by the French soldiers, was put into the fire, but was miraculously preserved. Ivan the Terrible, who was contemporary with Queen Elizabeth, had a church built which is very much admired. Seven little churches open one after the other, each round in form, six of them round a centre one. They are very pretty and full of interest, but exceedingly dark. Tradition says Ivan was much pleased with this church, and sent for the architect to reward him. When the man came, the Emperor had him seized and bound and his eyes were burned out in order that he might never be able to reproduce the church, nor to design one exceeding it in beauty. But the story is open to doubt. It is told of the designers of many famous buildings, including the cathedral at Strasburg. The church of the Assumption is very fine and well worthy of a visit. Within the walls of the Kremlin are seven churches, many of them very interesting. In one of these the Emperor was crowned. The Emperor himself places the crown on his head, he then crowns the Empress, who kneels before him. One of the churches in the Kremlin has the highest tower in Russia. From this tower the great bell of Moscow fell, and was broken. It stands on a pedestal on the ground, at least forty men could stand under it. Since that accident the bells are fastened to the floor with padlocks and chains. I went to the top of the tower and was very glad to get down again. A short time before our visit two so-called gentlemen went up. On arriving at the top one of them drew from his pocket a little cat and threw it over the parapet. The poor little animal turned round in the air a few moments, then got up and ran away, apparently quite unhurt. It was done for a wager, of course, but it was a brutal act. Ivan the Terrible was married six times. The Russian Church allows only three marriages, and in one of the churches a place is shown just outside the consecrated part where he was obliged to sit to hear divine service with his last three wives. I think it is in this church that the remains of Demitri the Martyr lie. He was son of Ivan the Terrible's fourth wife, and became Emperor at nine years of age. Ivan had three sons; the eldest he killed with a blow from a bar of iron; the second son became epileptic, and was therefore, by Russian law, unable to reign; little Demitri was the third son, son of the fourth wife. The brother-in-law of Feodor, second son, became Regent; his name was. Boris. He found power very attractive, and tried, first of all, to usurp the throne by declaring that Demitri, being the son of the fourth wife, was illegitimate; but the people were too much attached to the old dynasty to render this possible. He accordingly induced the child's attendants to leave him unguarded for half an hour in one of the courtyards of the Kremlin. When they returned all traces of the boy had disappeared. Boris gave out that the child was epileptic, and had been placed under restraint, which seemed a probable enough story, and there were no immediate heirs to contradict it, as his sister was childless, so he usurped the throne and assumed the title of Emperor. In later years a false Demitri arose, saying he had escaped from prison. In person he was very like the Imperial family, and his cause was taken up with great warmth, especially in Poland, to which country he said he had escaped, and he found many powerful supporters who provided him with soldiers and money. He succeeded in defeating Boris, whom he put to death, and seized the throne. He ruled neither well nor wisely, and was finally denounced by someone who seems to have known him well. The nobility took up arms against him, and his army was defeated. He threw himself from a window in the Kremlin as the nobles and their soldiers were entering to take him prisoner. Boris had had the remains of little Demitri exhumed and re-interred in one of the churches of the Kremlin. The Russian Church canonised the little martyr to love of power. Shortly after the death of Boris, the soldier who had killed the child and a housemaid who saw the wicked deed perpetrated, both confessed the crime. Michael Romanoff, then a boy of sixteen years, was elected by the nobility as their Emperor. His father had been viewed with suspicion and dislike by Boris, who forced him into a monastery. Michael was a wise ruler, and soon brought order and tranquillity to reign where all had been confusion and chaos. He had also family claims upon the throne, as two of the former Empresses had belonged to the house of Romanoff. Outside the gates of the Kremlin is a little church or shrine in which is kept the "miracle-working" image. It is guarded day and night, and priests are set aside for its sole service. Should anyone be ill and send for this image, it is placed in a carriage and guarded by two priests and taken to the house, where it is left for an hour or two; prayers are said and offerings are made, and the patient sometimes recovers. There is no specific charge made for the use of the image, but those requiring its intercession are supposed to give offerings or a present, according to their means. The Kremlin has five gates, each one guarded by two copper-covered turrets. The copper has turned green with age and the influences of the weather, and looks very picturesque. One of these gates is the far-famed sacred gate. On it is hung a picture of our Saviour, and all who pass beneath it are bareheaded. The Russians are a very religious people, and are not ashamed of outward observances. In this they remind one of the Roman Catholics of Ireland. At some little distance from the town is the palace in which Napoleon slept during his occupation of Moscow. In one of the yards of the Kremlin are hundreds of French cannons abandoned during the calamitous retreat from Moscow. Tolstoi says in his great work, "War and Peace," that the French were defeated not through human agency, but as the direct will of God, and laughs to scorn the idea that the general who retreated, and got the Moscow folks to fire their own residences, was actuated by military motives; he says it was all pure fate. I do not know, but almost all Russians give him credit for a far-seeing policy, and certainly the results justified his actions. Towards the south Moscow terminates in a large red gate, known as "The Red Gate." St. Petersburg also terminates with a gate, beyond which is country. These are the only two towns I know which do so. Some way beyond the Red Gate is a pretty house and park, belonging to the Emperor, called Niskutchni; it means "sans souci"; literally, "no sadness." We often went there and had tea in the house or garden, according to weather. Snowdrops, and many flowers, grow wild here all over the grass; cowslips have been introduced and flourish well. While we were in Moscow the Empress thought she would like to have the children's portraits painted, so an artist was engaged to paint them. They were aged at this time four years, two and a half years, and two months. He began by taking innumerable photographs of the children, then he made a collection of all existing likenesses, and then found he could not paint from photographs. He explained to me that it would not be artistic to do so. I begged him to remember what babies they were, and to work from photographs. But, no! even to paint their frocks he insisted upon them sitting to him for three or four hours each day. 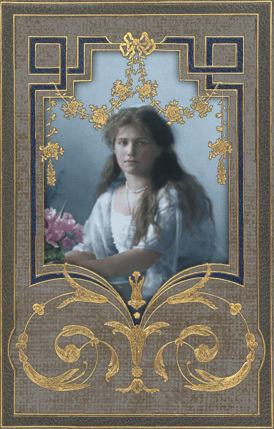 Of course the poor children got very impatient, and one day the little Grand Duchess Olga lost her temper, and said to the artist, "You are a very ugly man, and I don't like you a bit." To my amazement he was exceedingly displeased, and replied, "You are the first lady who has ever said I was ugly, and moreover, I'm not a man -- I'm a gentleman!" He could not understand why I laughed.